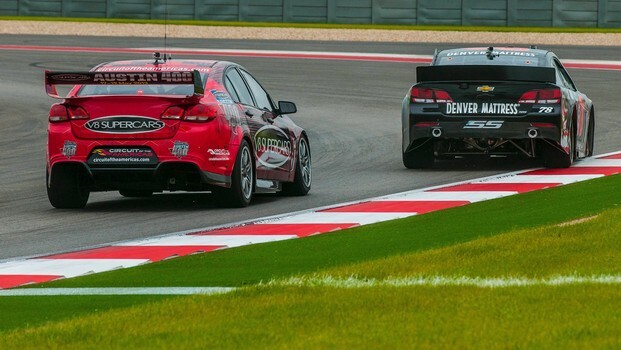 Today in a prelude to the first ever event in North America, 2004 NASCARSprint Cup Champion Kurt Busch and 2010 V8 Supercar Champion James Courtney droveeach other's cars around Circuit of The Americas. The Australian V8 Supercar is 400lbs lighter than a Sprint Cup car, butonly has 650 horsepower compared to 950 in NASCAR. The NASCAR was faster accelerating in a straight line but the V8Supercar far quicker through corners, making it a relatively equal contestbetween the two. Furniture Row-Racing's Busch had to adapt to sitting on the wrong sideof the car, a sequential shift gearbox and a dramatically smaller steeringwheel. Courtney also found himself on the other side of the car from what he isused to and had to revert to using a H-pattern gearbox that hasn't been used inV8 Supercars since 2007. The only similarities between the Chevrolet SS NASCAR and the HoldenCommodore V8 Supercar comes from their road-going versions – the same car issold in both markets in respective left and right hand drive versions. "It's amazing, there are similarities and differences between thetwo cars," Busch said. "Sitting on the right side, shifting a bunch of gears with my leftarm, you're not in your comfort zone and it's hard to understand what task ofthe car is next until you start checking things off your list that you learnthe racetrack as well. So there were quite a few things going on. Informationoverload, to say the least. "But it definitely makes it interesting to drive both cars on thetrack at the same time. "The quickest way I can compare an Australian V8 Supercar to whatpeople are familiar to in the States is it's a muscle car but it's a sports carat the same time. "Much more power than what you see in the GT classes in the GrandAm series. And the ability, though, for what I see on TV, for these guys to runside-by-side, nose to tail, is the control of the cars, the balance they havemakes it a treat to drive." Holden Racing Team's Courtney and fellow Championship contender LockwoodRacing’s Fabian Coulthard were on hand at the Circuit of The Americas fortoday's activities as well as last weekend's successful inaugural MotoGP eventwhere they undertook demonstration laps at the venue. For the vastly experienced Courtney, today's track action was a dramatictwist for the Australian who has driven a wide range of machinery includingFormula 1, Le Mans and Japanese Sportscars, Formula 3 and Formula Ford. 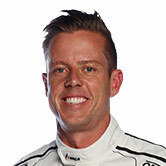 "It was pretty wild sitting on the other side of the car andshifting an H-pattern gearbox," Courtney said. "The car was bigger and heavier. It has so much power. It's reallyquite an experience. It was also quite cool to blow past the V8 car on thestraight. It was really good. I'm forever grateful that the team gave me thisopportunity. "The steering wheel, it feels like it's massive. But to runside-by-side I was pretty nervous because it's moving around a bit more thanwhat I'm used to. "But the car was excellent. Changing with an H-pattern gearbox isdifferent; it's done almost automatically in the car at home so you never thinkabout it. But another thing that is quite different is the braking performance. "It's built for Speedways, not really road courses. It's a verydifferent machine." Courtney and Coulthard will return home this week to prepare for thenext round of the V8 Supercar Championship, the Chill Perth 360 in Western Australia, on May3-5. Fortickets for the inaugural US event, visit the Circuit of The Americas websiteat http://circuitoftheamericas.com/v8-supercars.